It features OLED eyes, wide-angle cameras and will develop a unique personality. After more than a decade away, Sony's Aibo pet robot is making a return. The original dog-like robot launched in 1999, while Sony says its followup is "capable of forming an emotional bond with members of the household while providing them with love, affection, and the joy of nurturing and raising a companion." Its OLED eyes allow for "nuanced" expressions, fisheye cameras see and recognize individual faces while new actuators allow its body to move smoothly along 22 axes. The array of movements and sounds are intended to make Aibo more lifelike, while it's also capable of responding to voice commands and petting to learn what makes its owner happy. It's apparently also capable of learning the layout of your house over time, Roomba-style, to avoid obstacles and take the most direct route between locations. Inside there's a quad-core CPU, there's built-in LTE and WiFi, a number of sensors, motors and gyroscopes, speaker and four microphones. The battery is rated to last two hours, and takes three hours to charge fully so extended play sessions could be tricky. Pre-orders for the new robot begin tonight via Sony's online store in Japan for 179,000 yen (about $1,739 US), with shipments scheduled to begin on January 11th. Good luck getting one for use anywhere else -- Sony says that right now, it's only scheduled for launch in Japan. Of course, because this is 2017, not only is the new Aibo powered by AI (that learns and develops a unique personality over time) but it's also connected to the cloud. An Aibo Basic Plan subscription not only backs up your robot's unique identity but also turns on the connection for owners to access their remote via WiFi or a mobile connection. It costs about $27 per month, while a 3-year subscription can be purchased upfront for 90,000 yen ($790). 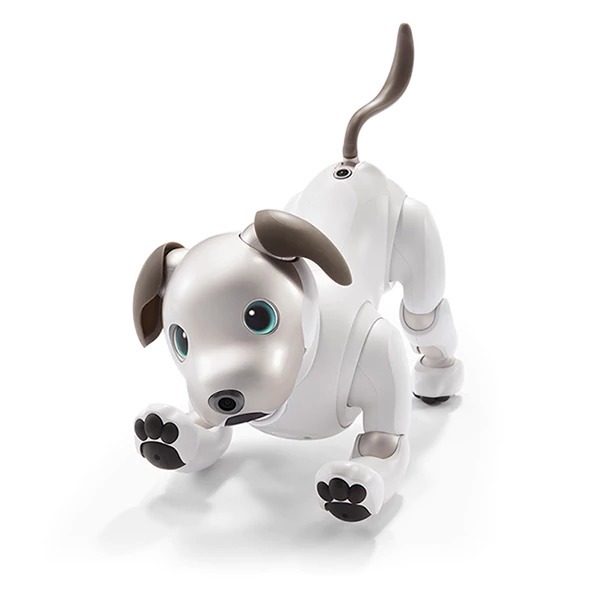 You'll need the subscription for your pet's AI tendencies to develop and to use its My Aibo app (on iOS, Android and the web) that can manage settings, access photos and play with a virtual version of the dog. Eventually, you'll be able to buy new tricks from the Aibo Store, but it can also learn them from other Aibo and gain new experiences as the seasons change or special events happen. The new Aibo is as much a service as it is an entertainment device, and it won't be the last one from Sony. The company announced separately that it's "steadily advancing multiple other initiatives in the AI and Robotics field."